Uluru and Lungkata Walk are good opportunities to explore the local culture. And it doesn't end there: explore the striking landscape at Kata Tjuta, contemplate the waterfront views at Mutitjulu Waterhole, appreciate the views at Valley of the Winds, and trek along Uluru Hiking Path. To see reviews, traveler tips, where to stay, and other tourist information, use the Uluru-Kata Tjuta National Park trip maker . Adelaide to Uluru-Kata Tjuta National Park is an approximately 7-hour flight. You can also drive. Traveling from Adelaide in April, expect nights in Uluru-Kata Tjuta National Park to be about the same, around 17°C, while days are a bit warmer, around 34°C. Wrap up your sightseeing on the 8th (Mon) to allow time to travel to Sydney. Satisfy your inner culture vulture at The Rocks and Art Gallery of New South Wales. Spend the 12th (Fri) wandering through the wild on a nature and wildlife tour. 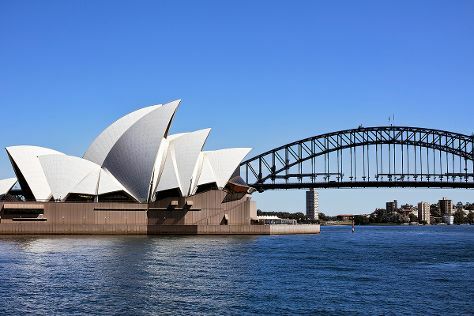 And it doesn't end there: catch a live performance at Sydney Opera House, stop by DUX Collection Sydney, wander the streets of Darling Harbour, and take in nature's colorful creations at Royal Botanic Garden Sydney. To see ratings, more things to do, photos, and more tourist information, refer to the Sydney trip itinerary app . Fly from Uluru-Kata Tjuta National Park to Sydney in 5.5 hours. Alternatively, you can drive. When traveling from Uluru-Kata Tjuta National Park in April, plan for slightly colder days in Sydney, with highs around 26°C, while nights are about the same with lows around 17°C. Finish your sightseeing early on the 12th (Fri) so you can travel to Lord Howe Island. Historic Village Herberton and KickArts Contemporary Arts are good opportunities to explore the local culture. Venture out of the city with trips to Hartley's Crocodile Adventures (in Palm Cove) and Four Mile Beach (in Port Douglas). Spend the 13th (Sat) among aquatic life with a scuba or snorkeling tour. There's more to do: pause for some serene contemplation at St Monica's Cathedral and take in the exciting artwork at Bones and Jones. For where to stay, more things to do, ratings, and tourist information, go to the Cairns road trip planner . You can fly from Sydney to Cairns in 6 hours. Other options are to drive; or take a train. Traveling from Sydney in April, things will get somewhat warmer in Cairns: highs are around 34°C and lows about 26°C. Finish your sightseeing early on the 16th (Tue) to allow enough time to travel to Darwin. On the 17th (Wed), see the interesting displays at Museum & Art Gallery of the Northern Territory, then examine the collection at Defence of Darwin Experience, and then take an in-depth tour of RFDS Darwin Tourist Facility. On the next day, get a dose of the wild on a nature and wildlife tour. To find more things to do, ratings, where to stay, and more tourist information, refer to the Darwin attractions planning website . You can fly from Cairns to Darwin in 4.5 hours. Alternatively, you can drive; or take a bus. Traveling from Cairns in April, you will find days in Darwin are somewhat warmer (38°C), and nights are about the same (28°C). Wrap up your sightseeing by early afternoon on the 19th (Fri) to allow enough time to travel back home.